Submitted by Taps Coogan on the 6th of April 2016 to The Sounding Line. Greece is making headlines once again as it attempts to renegotiate its current bailout arrangement with Brussels and the IMF. As it so often has, Greece is failing to meet the predetermined conditions to receive further financing based on its August 2015 bailout. 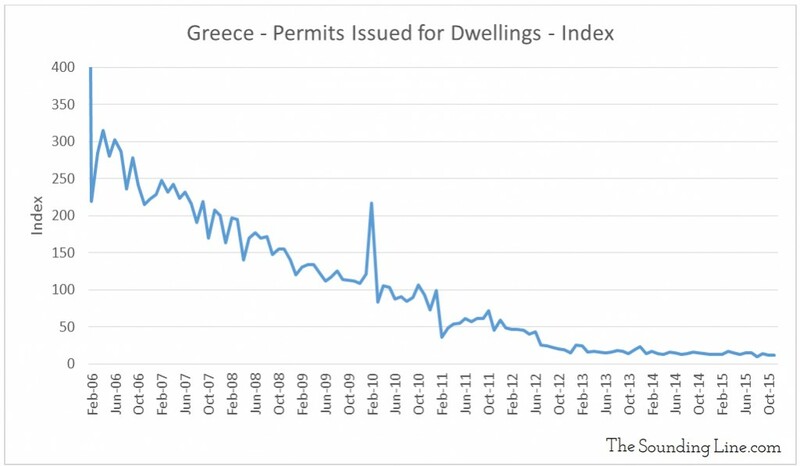 It first became clear that a Greek government default was imminent in 2010. At the time, Greece had a national debt of €329.52 billion. The European Commission, European Central Bank (ECB), and International Monetary Fund (IMF), collectively known as the Troika, determined that the best way to save the heavily indebted Greek government was to provide €110 billion in new loans to Greece. 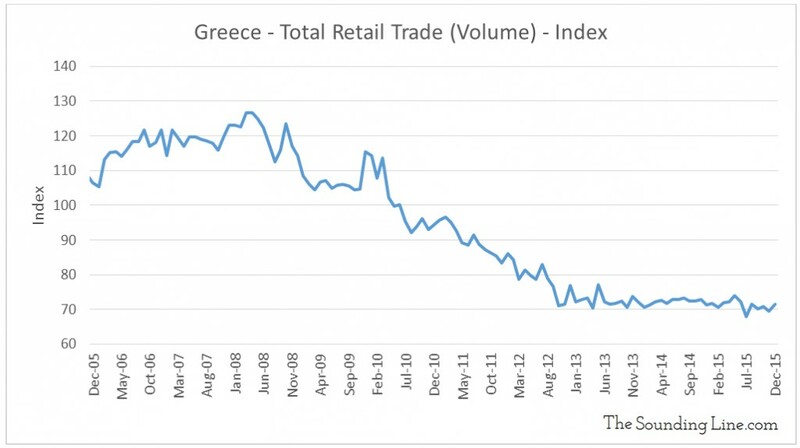 It soon became obvious that the additional debt hadn’t been enough to save the Greeks from their debt crisis so the first bailout was expanded by €109 billion of new loans and debt restructuring in July 2011, again by €130 billion in February 2012, and most recently by €86 billion in new loans in August 2015. All of these bailouts have essentially been ‘loans for reforms’ arrangements whereby Greece periodically qualifies for tranches of new loans and debt restructuring only if they successfully implement reforms and reduce their debt-to-GDP ratio. Like today, various crises have emerged when Greece needed to receive the next tranche of loans to avoid default but still hadn’t fulfilled their obligations under the previous agreement and/or because their level of indebtedness had gotten worse instead of better. The answer is €345 billion. That’s €15 billion more than when the crisis started in 2010.It is no surprise that a strategy of loaning Greece even more debt to resolve their debt crisis hasn’t reduced their indebtedness. In fact, the new debt provided by the bailouts has outweighed the austerity, tax increases, and debt restructuring that was implemented and upon which new loans were contingent. “Did all of this at least decrease the size of the Greek debt in relation to the size of the Greek economy? That answer is also no. The Greek debt-to-GDP ratio has increased from 148% in 2010 to over 179% today. Considering that a key condition of the various bailouts was that Greek debt-to-GDP decrease below 120% by 2020, the failure of the entire strategy becomes abysmally clear. We are certainly not the first to point out that a crisis caused by too much debt cannot be resolved by an even larger amount of new debt. We also won’t be the first to point out that if Greece’s creditors were willing in the past to renegotiate the terms of their bailouts to prevent a default, then the Greeks might expect to be able to renegotiate once again. That’s not a great reason to adhere to the terms of the bailouts. This is even more true when the Greeks passionately believe that the terms of “austerity” undermine the ability of the Greek economy to grow. While the Greek crisis looked bad in the past, their debt burden is still building and looking even worse today. 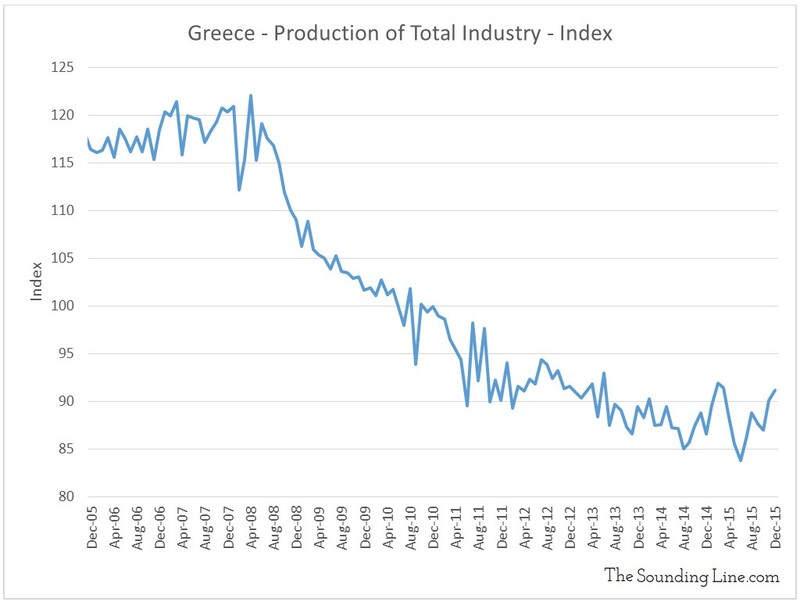 Compounding the worsening debt problem is the fact that the Greek economy is showing no signs of recovery. As shown in the chart below, there has been no improvement in industrial production going back to 2008. 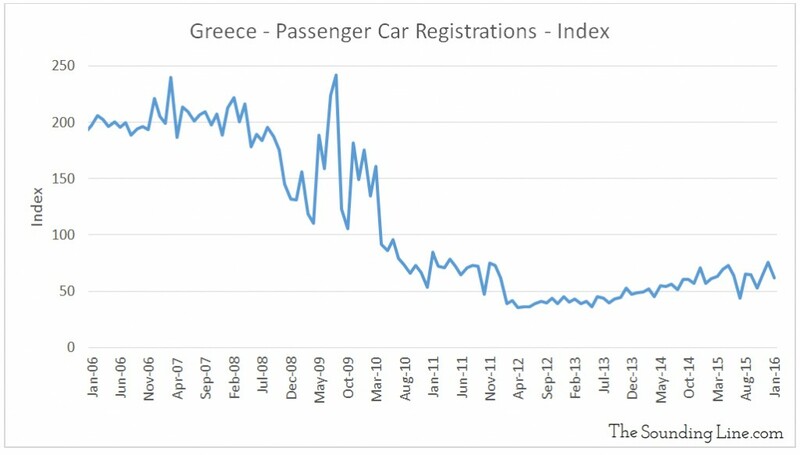 Nor has there been much of an improvement in the rate of passenger car registrations. With the Greek economy showing no sign of improvement despite receiving extensions and more new debt in the bailouts than it owed at the start of the crisis, one thing becomes eminently clear: more debt will not help Greece. It might end up being called ‘debt forgiveness’ or a ‘debt haircut’ or any number of things, but additional extensions and loans have not and will not help. Greece will default. With over €10 billion in loan repayments in June and July, a mere 60 days away, expect to hear more. Then there is the Brexit vote complicating the optics of yet another bailout renegotiation. Together the extraordinary Wikileaks revelations and a faltering French economy, only make the Greek deal more complicated. Fantastic piece. Any predictions on when Greece might default?